The design of the 2013 Magic City Art Connection (MCAC) media campaign took shape by bringing together the work of a burgeoning local artist and a seasoned graphic designer with a keen, creative eye who also loves to collect art. 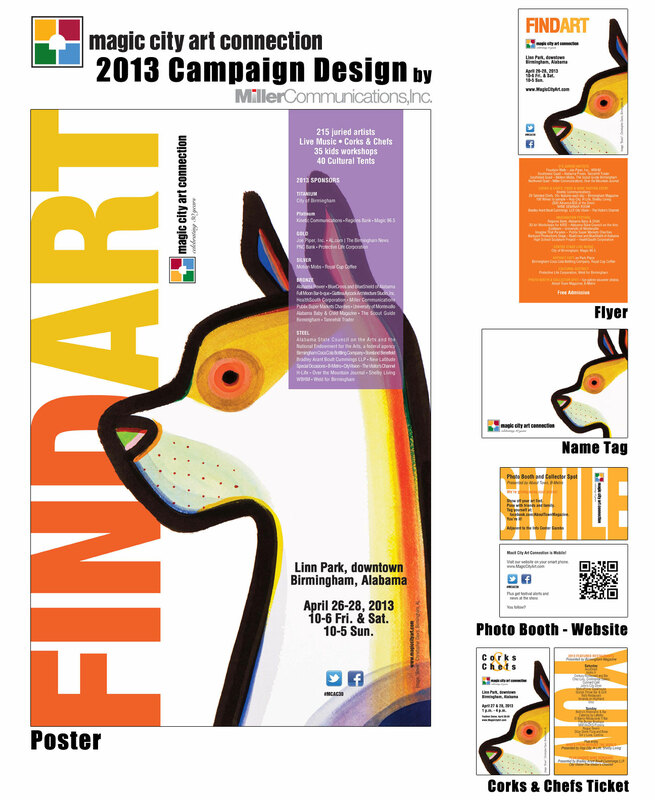 Birmingham, Alabama’s Christopher Davis and his piece entitled “Boxer” with its pop art flare provided the base for Scott Miller of Miller Communications, Inc. to create a whimsical, eye-catching design campaign for the 30th annual festival. Miller Communications is no stranger to the festival. They are responsible for the design campaign from years 2008 until 2010. During this time, MCAC was featuring the artwork of its artist-jurors on the poster, all of which have received national and international recognition in the art world. Bringing these talented artists to Birmingham was a great collaboration between the art show and Scott Miller, the collector. It not only exposed Birmingham to these up and coming artists whose work is respresented in many notable museum and private collections, but it also kick started a professional artist initiative at the festival that nurtured a great peer to peer platform while also fostering conversations about the future of art and artists in Birmingham and beyond. For our 30th anniversary, the festival was keen on featuring the work of a home-grown talent with a contemporary edge that is pure MCAC. It was a perfect marriage as MCAC connected two local art and design visionaries to create a visually striking and memorable media campaign. A special thank you to Scott Miller and the Miller Communications team for continuing to give impact to Magic City Art Connection’s brand design, while always keeping it fresh and artful. Bravo! Keep your eyes peeled around town for “Bart the boxer” on posters and flyers, as he was lovingly named in our Facebook contest. We also call him “Art” for short. Find Art!